You're going to love what Claire has to say about Rob in this interview with Vogue Homme. 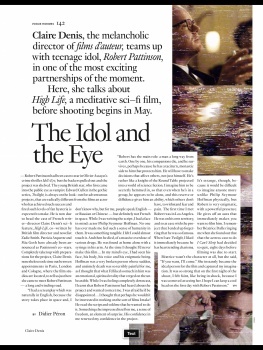 She talks about first meeting him, how his confidence in High Life renewed her confidence in the project, how he gives off an aura that makes you immediately want to film him and more. I especially like the part at the end where she's hoping she'll be able to keep a cool head on the first day of filming. Good luck with that one Claire. Thanks so much to Verena for sending to us!